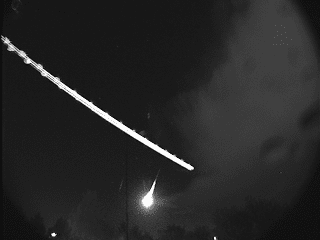 Beratus-ratus lapuran telah dibuat berkenaan munculnya meteor bebola api yang tidak dijangka di terima di Britain, ireland, Kanada, Holland dan sebahagian eropah timur. Ia lebih menggemparkan kerana bebola apinya yang terang berwarna kuning dan oren. Sesetengahnnya mengatakan keadaan langit seperti didalam cerita The Independence Day -merujuk cerita mengisahkan penaklukan oleh makhluk asing dari angkasa lepas. 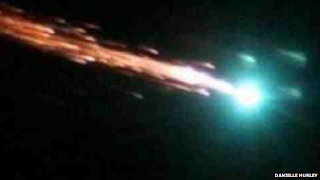 One person who contacted the BBC said it was "kind of a mass of light, gold light. Everything moving in unison". "It wasn't diverging... I thought it was a plane at first. It was quite low on the horizon and moving much slower than I'd expect to see a shooting star, but it was amazing." Another said the sight was "like Independence Day" - a reference to the film about an alien invasion of Earth. Diane Martin from Rainworth in Nottinghamshire said she saw "a bright yellow and orange ball" and considered calling the police before her husband checked the internet and found other people had seen it. She told the BBC: "We only saw the one. It was quite low as well. It wasn't that far away to be honest. We thought something was actually going to come down in the actual village. "It was travelling from east to west. It was coming down but it was going across more than it was going down." Durham Constabulary said they were "inundated" with calls from members of the public across the north-east who were "concerned" as to the sightings of unidentified flying objects lighting up the night sky. 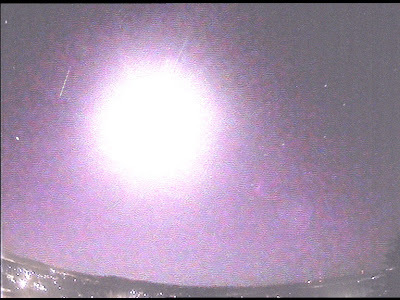 The American Meteor Society has received over 30 reports of a bright meteor that occurred near 23:00 (11:00pm GMT) on Friday September 21, 2012, over the United Kingdom and Ireland. Brightness estimates of this fireball vary considerably, but the average lies near magnitude -13, which is equivalent to the light produced by the full moon. Every color of the rainbow has been reported with orange being the most predominant. Evidently this object lasted much longer than the average fireball and a majority of the reports mentioned fragmentation. Summaries of individual reports may be viewed in the 2012 AMS Fireball Table Refer to event #1379 for 2012.